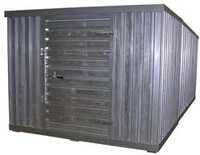 Modular storage building are ideal for keeping valuable items secure. 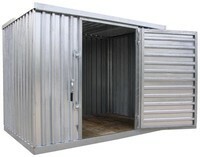 Constructed of maintenance free galvanized corrugated paneling. The door measures 45"W x 74"H usable and features a right-side hinged lock (padlock not included). Modular design is easy to assemble. Once assembled unit can be moved with a fork lift. Each unit features a wooden floor 5 3/4" high to help keep products dry. Built-in rain gutters for water drainage is standard.